Lock in a great price for Hotel Fazenda Calá & Divino – rated 9.6 by recent guests! hotel delicia, vista maravilhosa, atendimento top! Luiz e Bruno nos recepcionaram com muita simpatia e foram muito prestativos. Adoramos o bar da praia, todos muito alegres e queridos! abracos Marcelo e Helena. Accueil exceptionnel dans un cadre de rêve ! Cuisine raffinée et excellente. Service de grande qualité. Décoration des chambres et des parties communes très soignée. Troisième séjour, et de mieux en mieux..bravo et merci à tous ! SEGUNDA VEZ NESSE HOTEL INCRIVEL, COM UMA VISTA PERFEITA. CAFE DA MANHA MUITO BOM, FUNCIONARIOS SIMPATICOS E PRESTATIVOS. BAR DE PRAIA OTIMO TAMBEM. CEU LOTADO DE ESTRELAS. O JANTAR ESPECIAL NO TERRACO( COM RESERVA) EH IMPERDIVEL. Muito interessante e perfeito para casais que gostam de um lugar calmo e longe de tudo . Café da manhã excelente, quarto muito confortável e serviço de praia ótimo. Além disso, o hotel fica em um canto reservado da praia, muito apropriado para descansar. O quarto era confortável, espaçoso. Muito bom. A vista do quarto e a praia são maravilhosas. Serviço de praia ótimo. Café da manhã bom . Maravilhoso! Sem nenhum defeito! Altamente recomendável para quem quer paz! Hotel Fazenda Calá & Divino This rating is a reflection of how the property compares to the industry standard when it comes to price, facilities and services available. It's based on a self-evaluation by the property. Use this rating to help choose your stay! Right on the beautiful Espelho Beach, Calá & Divino offers accommodations with a patio and sea or garden views. Services include kayaks, bicycle tours, a regional restaurant and bar. Wi-Fi is free. Bright and airy, rooms at Hotel Fazenda Calá & Divino combine modern and rustic styles. They provide a mini-bar, tiled floors and a private bathroom. Homemade breakfast with fresh fruits and local specialties is available. Guests also enjoy a menu with dishes from Bahia, plus Mediterranean and international cuisine. The restaurant provides a terrace with breathtaking views of the Atlantic Ocean. The charming Trancoso historical village is 16 mi away. Bars and restaurants can be found 1.2 mi from this guest house. 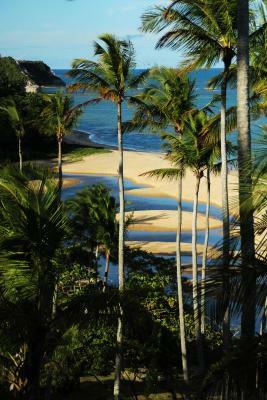 This property also has one of the top-rated locations in Praia do Espelho! Guests are happier about it compared to other properties in the area. When would you like to stay at Hotel Fazenda Calá & Divino? 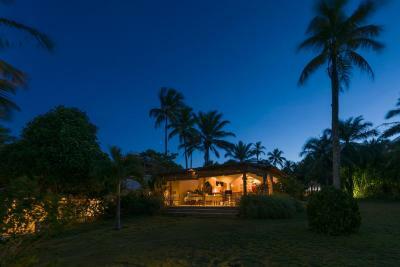 Boasting a furnished patio with sea views, this rustic bungalow comes with a mini-bar and a spacious private bathroom. 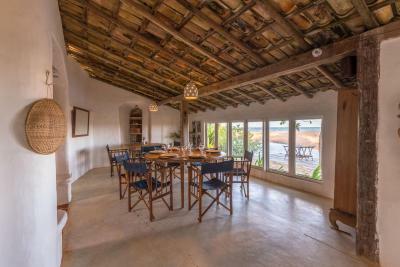 Boasting a furnished patio with sea views, this rustic, air-conditioned bungalow comes with a TV, mini-bar and a spacious private bathroom. This special offer includes a candlelight dinner and a national sparkling wine, for stays over 3 nights in September. Please note that the dish menu and the sparkling wine must be chosen from the available options. House Rules Hotel Fazenda Calá & Divino takes special requests – add in the next step! Hotel Fazenda Calá &amp; Divino accepts these cards and reserves the right to temporarily hold an amount prior to arrival. Hotel Fazenda Calá & Divino accepts these cards and reserves the right to temporarily hold an amount prior to arrival.